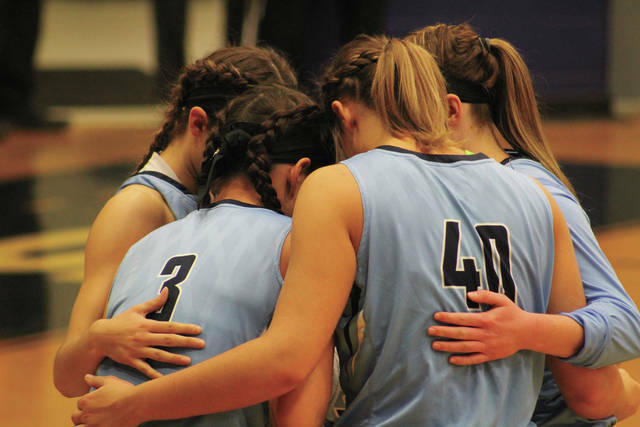 Shawnee State’s starting five huddle together before the start of Thursday evening’s contest against Campbellsville. The Bears took home a thrilling 90-78 victory in overtime and outscored Campbellsville 15-3 in the final quarter en route to doing so. In any athletic stage, there are great games, and then there are contests that are so intense in every facet that it raises the said program in question up a notch from where it was prior to the game’s commencement. On Thursday evening, the No. 1-ranked Shawnee State University women’s basketball program, playing as the top dog for the first time in 17 seasons in an NAIA Poll — and for the first time ever in the NAIA Division I ranks — made sure that the rest of the country knew that the honor was a well-deserved one. The Bears, in a home bout against No. 3-ranked and MSC foe Campbellsville University, used two late free throws from Coal Grove native Hannah Miller to tie the score with 18.7 seconds left in regulation to send the game to overtime. Miller then followed by scoring Shawnee State’s first 11 points in overtime en route to outscoring Campbellsville 15-3 in the overtime session and taking home a 90-78 overtime victory on Thursday evening as part of Portsmouth Community Night. For Jeff Nickel, the fifth-year head coach couldn’t have asked for anything more in a contest that featured a packed house and an intensity level that had people coming away from the contest feeling as if the game was more like a tournament atmosphere than anything else. From the outset, Lovely wasted no time putting on a show for the near-capacity crowd as the junior from Jamestown, Ohio drained four consecutive threes in the opening quarter to keep Shawnee State right in the heat of the battle. The 5-9 guard ultimately canned each of her seven makes from behind the arc as Lovely — who tied with Bailey Cummins for a team-high 45 minutes — scored 12 of her 21 points in the first quarter alone as the Bears trailed by just one, 17-16, after a quarter of play. The sensational talent added seven rebounds and two steals in addition to her 21-point output. Lovely’s hot shooting stroke then spread to the entire unit as the second quarter went along. Ridout and Shania Massie, who starred at Jackson and Greenfield McClain during their high school prep days, each canned three-pointers along with Lovely — who added her fifth three-pointer of the first half for good measure — as Shawnee State shot 12-of-28 from the floor but went a blistering 7-of-13 from three-point range as a team in the first half of play. The Bears ultimately took a 35-29 advantage in the quarter before Campbellsville closed the margin down to 35-33 at the halftime break. Setting up the blistering offense for Shawnee State during this stretch was Bailey Cummins, who put together another well-balanced performance as one of the best lead guards in the country. Cummins ultimately accumulated five of her seven assists in the first half, and added three steals and three rebounds to boot to affect the game in all facets once again. In addition to Ridout, Lydia Poe, who combined with her former Jackson teammate to supply 11 of Shawnee State’s 23 points in the frame, used her strong inside presence and her excellent rebounding skill to limit the overall effectiveness of Jordan Doram. The junior forward scored 17 points on a solid 8-of-15 mark from the field but only grabbed two rebounds and had six turnovers to no assists as Poe, at 6-2, bothered the 5-11 Doram — who only averaged 1.6 turnovers per contest coming in — all night long as the Bears obtained a 58-53 advantage after three quarters of play. Poe’s 15 points and eight rebounds, along with Ridout’s 15 points and 11 rebounds, were huge numbers in the final outcome. Down 68-61 with 4:59 to play in the contest, Madison Faulkner stepped up big for the Tigers as Faulkner, a sophomore forward, scored a team-high 22 points on 9-of-18 shooting to not only fuel a 51.6 percent shooting mark for Campbellsville in the second half, but lead the Tigers back to within 71-69 with 2:39 to play. Campbellsville ultimately took a 75-73 advantage with just 24.9 seconds to go as Faulkner finished through contact and added the ensuing free throw to give the Tigers a one-point lead before the Tigers added to it with another free throw. However, with its No. 1 ranking and its unblemished MSC mark hanging in the balance, Miller stepped up in a big way for Shawnee State with her crafty work. Her outstanding poise from the charity stripe (an astonishing 15-of-16 from the free throw line) ultimately proved to be the difference, as did her shooting in overtime — where two of her three field goals came from. In the win, Lovely, Cummins, and Ridout each put together garguntuan efforts as the trio each played at least 40 or more minutes during the affair, with Lovely and Cummins never even coming out of the contest en route to playing all 45 minutes. Miller’s 34 minutes of playing time, along with Poe’s 28 off of the pine, proved to be critical, as well. Nickel, however, credited his players for their wherewithal, as well as Doran Martin, who serves as Shawnee State’s Strength and Conditioning instructor as part of his assistant coaching duties. Games like this, however, can’t be won without extra brainpower. And with the help of Jack Branon, Tim Sammons, Abby Feuchter, Doran Martin, and Jonessa Moore, Nickel knows that is certainly loud and clear. Shawnee State (24-3, 11-0 MSC) will host Georgetown (Ky.) (8-18, 2-9 MSC) on Saturday, Feb. 17 as part of Senior Day while Campbellsville (22-4, 9-2 MSC) will travel to Pikeville (13-14, 4-7 MSC).